I have something really important to share with you. You may not like what I’m about to say. I’m not trying to upset you or anything. But I am going to say it anyway. Or maybe even blasphemous to some. Glad I got that off my chest. I feel much better now, thank you! In all seriousness, though, that's how I really feel. 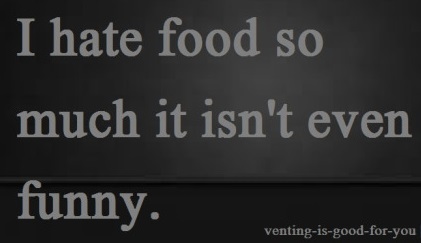 I know for me personally, food is the root of all evil. Or at least it feels that way, sometimes. Don’t get me wrong, I think a lot of food TASTE good. It’s an essential element for maintaining basic, primary survival. I get it, I’m really not delusional. And just to clarify, I don’t have an eating disorder either, despite what I’ve been told in the past with my medical history, but I’ll get to that in a moment. "Well, it was good idea in theory..."
You can have the best intentions in the world. The plan can be fool-proof. You have everything all planned out and every T has been crossed… What could possibly go wrong? But we all know how these types of situations end. It is truly miserable to feel this way each and everyday for the entirety of your life. I’ve decided to move this to the top menu and keep updating the threads. Keep checking back for new information and advice on surviving life when you can’t eat. Previous story about the onset of my distaste for food listed here.